Software Used Images Plus 5.5 for camera control. Images Plus 5.75 for calibration, stacking, digital development, multiresolution sharpening and star shrinking. Photoshop CS5 used for levels and curves, lab color, selective color, match color high pass filter, screen mask invert, and unsharp mask. Gradient Xterminator for gradient removal. Registar for registration and alignment. Carboni Tools for additional noise reduction and smoothing. HLVG for additional color adjustment. Notes Although I've posted this image on my website, this image was captured and processed by my daughter, Valerie Rosen (with a little help from me). We were both very happy with how much of the faint outer dust regions Valerie was able to bring out, as well as some beautiful star color. Whlie Valerie has helped me with a few other images, this is the first one where she did everything from start to finish! 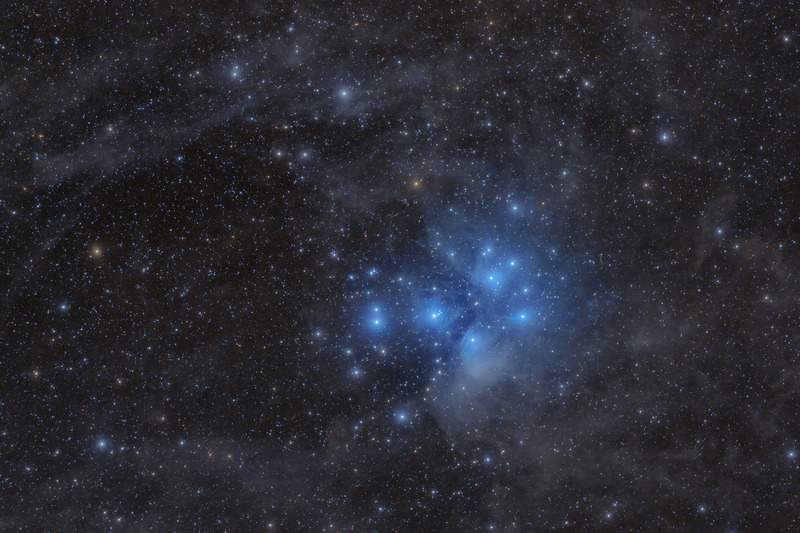 And...this image won first place in Astrophotogallery.org's Easy-Cluster category for January 2014! Plus, Valerie's M45 image was also published in the April 2017 issue of Sky and Telescope magazine in their article entitled "Herschel's Ghosts" (p. 31)!! !